Servant stage does everything with excellence in mind. A look at the past will give you an idea of some of the things we will do in the future. If you're In The Mood for an energetic song-and-dance tribute to the Swing era, this is the show for you! Featuring Jive, Lindy Hop, Charleston, and the wonderful music of legends like Duke Ellington, Count Basie, and Benny Goodman, Sing, Sing, Swing is a joyful and nostalgic salute to the jitterbug! Fats Waller described the uniquely American music as "one-third rhythm and two-thirds soul." Bye Bye Birdie is one of the most captivating shows of our time. It is a satire crafted with the fondest affection, told through musical theatre classics like Put On A Happy Face, A Lot of Livin' To Do, Kids, The Telephone Hour, and Honestly Sincere. This is the tops in imagination and good old-fashioned fun. From the duo that wrote the songs and lyrics for the Broadway musical Mary Poppins comes a heartwarming story that is sure to delight audiences of all ages with sparkling wit, unique charm, and memorable score. Witty and hilarious, but also deeply moving, Honk! Jr. will move you to equal amounts of laughter and tears. In collaboration with Servant Stage and Lancaster Bible College’s Summer Musical Theatre Camp, and featuring students age 10 to 18. The Broadway musical by Frank Wildhorn Jr. Drawing on letters, diaries, firsthand accounts, and the words of Abraham Lincoln, Frederick Douglass, and Walt Whitman, The Civil War is a thrilling and awe-inspiring "dramatic theatrical concert." This epic thematic revue puts a human face on the greatest tragedy of American history. It explores the experiences of the soldiers and leaders who fought for their way of life. It also examines the lives of the lovers and families they left behind, as well as the hopes and fears of the slaves whose freedom was at stake. This musical passionately asks us to consider our beliefs about freedom, honor, and faith. Based on the classic American novel, Little Women follows the adventures of sisters, Jo, Meg, Beth and Amy. Jo is trying to sell her stories for publication, but the publishers are not interested - her friend, Professor Bhaer, tells her that she has to do better and write more from herself. Begrudgingly taking this advice, Jo weaves the story of herself and her sisters and their experience growing up in Civil War America. A theatrical celebration of everyone's favorite Christmas music, holiday memories, and yuletide traditions! Suspense, intrigue, and mystery! Match wits with the world’s greatest detective, as Servant Stage brings another Victorian classic to the stage. The game is afoot! Watch the next generation of performers in the hit Broadway musical, based on the Gospels and parables of Jesus, featuring classic songs like "Day by Day," "All Good Gifts," and "All For The Best." In collaboration with Servant Stage and Lancaster Bible College’s Summer Musical Theatre Camp, and featuring students age 10 to 18, it’s the first production ever from Servant Stage’s new Youth Theatre program! It's back by popular demand and better than ever, featuring new songs and groups from a cast of 75 performers, with more of the same beloved hymns and Gospel songs, hand-clapping, foot-stomping harmonies, and old-time radio comedy! Strike Up The Band for a ’S Wonderful song-and-dance tribute to the Fascinatin’ Rhythm of Gershwin. Who Could Ask For Anything More? "...a prime example of what Servant Stage does exactly right." Celebrate Christmas with a family classic! Fantastically funny and timelessly tuneful, this clean-cut musical revue will awe with precision harmony and 50’s style crooning. You will laugh till you cry at the hilarious antics of the fabulous foursome in this song-and-dance sensation. With classic songs such as ‘Moments to Remember,’ ‘Heart and Soul,’ ‘Love is a Many Splendored Thing’ and more! Gilbert & Sullivan’s beloved comic opera, famous for its dynamite songs, saucy satire, and gleefully entertaining story. The captain's daughter is in love with an ordinary sailor but her father has a more sophisticated suitor in mind. Will she and her beloved defy convention and set sail for love? 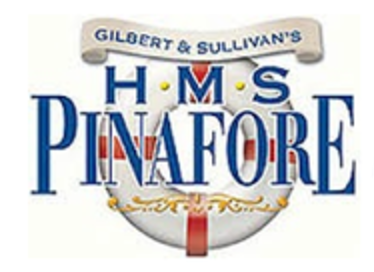 Hummable, quotable, and utterly enjoyable, HMS Pinafore is pure joy and sensational entertainment for the whole family! Enjoy the beautiful songs and dancing of yesteryear, as we celebrate with classic Christmas songs and beautiful arrangements of traditional carols. One of the funniest and best loved plays ever written, overflowing with razor sharp wit, sublime elegance, and dizzy romantic comedy. Servant Stage Company presents two fantastic productions of The Importance of Being Earnest directed by Bonnie Bosso. The Main Production will feature an outstanding cast of veteran actors, lead by Dan Deal (Algernon) and Chris Wert (Jack). The Emerging Artists Production, presented in collaboration with Lancaster Bible College, will feature talented up-and-coming actors and Lancaster Bible College students. A patriotic tribute to Broadway & Barbershop, Standards & Swing, Gospel Spirituals and much more! Celebrating America’s history, culture, and traditions through music and dance! A hand-clapping, foot-stomping, uplifting affair of fiddles, banjos, and harmonies, including songs such as “I’ll Fly Away,” "His Eye Is on the Sparrow," and "Down to the River to Pray" performed by a cast of more than 20 vocalists and instrumentalists. 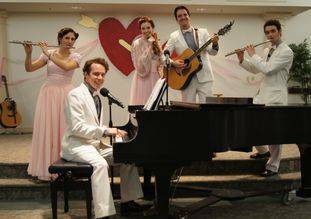 Combining marvelous vocals, tight-knit harmonies, and show-stopping theatricality, these five versatile performers do it all- from crooning to comedy to dancing and instrumentals!